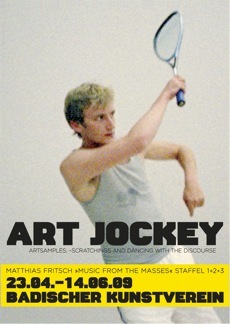 From April to June 2009 the German Media Artist Matthias Fritsch presented Art Jockey, three consecutive exhibitions to take place at three different cultural institutions in Karlsruhe. Fritsch presented a combination of his recent work series, occupied with the investigations of the possibilities of contemporary new media art. 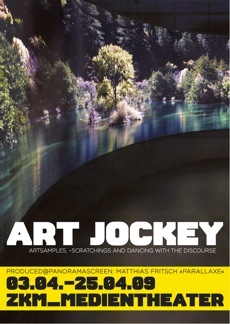 At the ZKM (Center for Art and Media Technology) Matthias Fritsch showed "Parallaxe", a group of four HD-Video-Panoramas. Each of the four panoramas depicts a "natural" landscape, which appears as pure natural scenery untouched by the tourist industry. Reflecting the desires and dreams of a global society based utterly on technology, the spectator can experience the scenery of these "natural paradise" within an artistic installation. The depicted scenes are technical manipulations and the experience of natural beauty here is an experience of technical beauty. 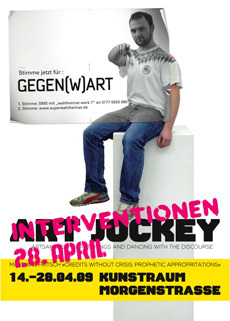 From April 14th until April 28th the independent art space Kunstraum: Morgenstrasse showed Matthias Fritsch's work Credits without Crisis: Prophetic Appropriations. Reflecting the strategic attempts of original Appropriation-Art, Fritsch refers only to works of young and mainly unknown artists at the beginning of their career, artists from his local and social network in Karlsruhe. 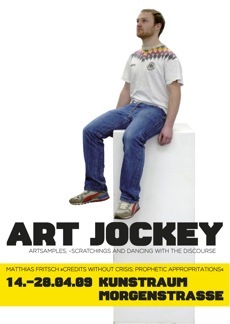 Different from the well known Appropriation Art of the 80s, Fritsch is neither appropriating famous works from art history nor from commercials. Neither the authorship nor the former fame of the past is questioned here - it is the open future to come. At Badischer Kunstverein from April 23rd until June 14th the artist presented the open series Music from the Masses, an unfinished group of works using the Internet and user generated sites such as YouTube as a medium of art. Music from the Masses so far consists out of more than 50 music videos. Artists and musicians from all over the world were generating various musical interpretations to silent video and film clips produced by Fritsch. Reflecting and focusing on the actual practice of recycling and reuse of films and videos at sites like YouTube Fritsch raises questions of authorship and distribution, each elementary for the usual perception of art. 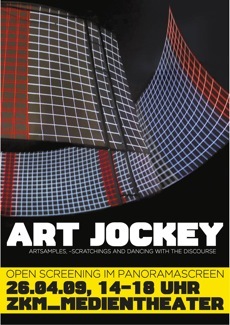 On April 26th Frtisch will hosted an open screening at the PanoramaScreen at ZKM. The artist opened up his installation to invite art students from Karlsruhe to present their works. Ten new works were publicly shown. Lecture: "TechnoViking - an Echo from Web 2.0"
At Badischer Kunstverein Matthias Fritsch temporarily installed a recording studio. The audience was invited to participate and produce new musically interpretations which were be added to the exhibition later on. On their own, the three integrated yet distinct exhibitions are proposals for open platforms. All singular presentations in Art Jockey are determined by questions of the collective and technically controlled perception and production as well as by questions of the experimental integration of social networks in contemporary art production and distribution. The exhibition also refers to the complex and heterogeneous filaments of Matthias Fritsch's artistic work, with the invitation of the audience to connect them. It is therefore that Art Jockey as an exhibition has to exceed the usual spatial limits of art exhibitions.